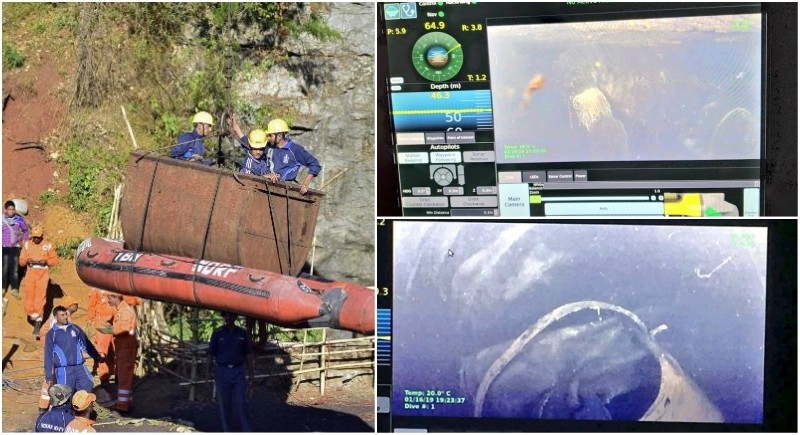 Imphal, January 17: After a month of a rigorous attempt by the government, and the rescue team to save miners trapped in Meghalaya, the Indian Navy divers have detected a body in the illegal rat-hole coal mine. The body of the miner was detected at a depth of approx 60 feet and 210 feet inside the mine, by the Indian Navy Divers using Underwater ROV (Remotely Operated Vehicle). The 15 miners were trapped in an illegal rat-hole coal mine in the East Jaintia Hills district, Meghalaya. The body has been pulled up to the mouth of the rat-hole mine and will be extracted out under the supervision of Doctors and other specialists. Meanwhile, the rescue operation further continues to detect the remaining 14 miners in the rat-hole mine. At least 15 miners got trapped in the 370 foot-deep illegal coal mine in Lumthari village of East Jaintia Hills district of Meghalaya on December 13 and constant efforts have been made by the rescue teams to find them. The state government has been taking the help of various utilities to rescue the trapped miners. More than 200 rescuers from the NDRF, the Odisha Fire Service, Navy, State Disaster Response Fund, state Fire service, and others are involved in the rescue operations.